With nearly limitless ways to customize data sets and run analytics, keep tabs on applications, and generate competitive insights, Juristat Platform has to power to boost your firm’s performance and bottom line. Our powerful search algorithms and intuitive interface help sift through more than 9.7M patent applications, giving you immediate access to information like claims, file histories, parent and child application information, rejection bases and cited art for each office action, and much more. In just a few clicks, you are able to download a full file history, or generate office action response shells. Juristat helps firms discover strategies to maximize client success and increase revenue. With Platform and Examiner Reports, firms can uncover missed opportunities like interviewing more frequently or one more office action when it provides the best chance for client success. Zero in on critical technologies to see how they’re developing – and who’s filing applications on them. With Platform’s filters, saved searches, and alerts, you can stay up to date on the latest activity within a particular technology. For example, find out which assignees are filing the most in a particular area, what tech centers the applications are in, how filings have changed, and each tech center’s allowance rate. 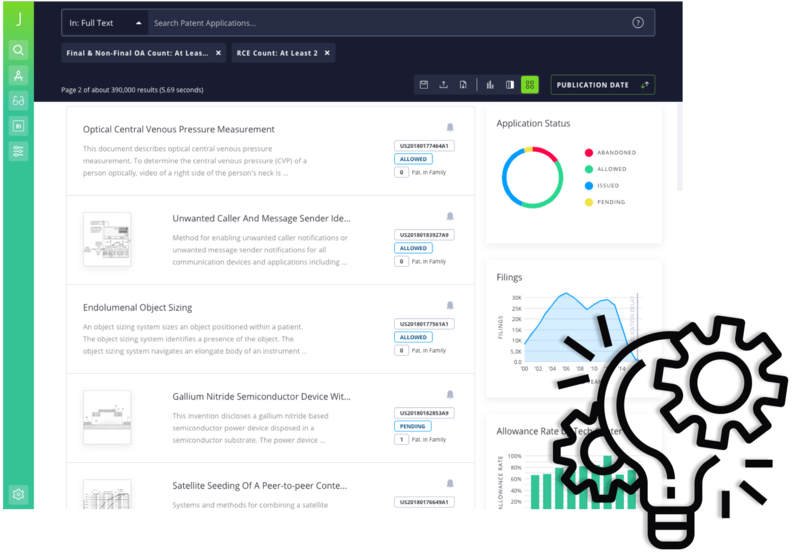 With the power to review big-picture trends or dive into an individual office action, Platform’s detailed analytics offer unparalleled insight to help you get control of high-cost prosecution and strategically allocate budget to your most promising applications. Have you ever wondered how your firm is performing for applications filed in the last five years receiving at least three office actions in Class 709? Now those answers are just a few clicks away. Build and export bespoke data sets. Platform offers nearly limitless ways to customize and visualize your data sets. Choose from more than 125 data points structure your data any way you like, and save your datasets to custom tables and dashboards that stay up to date automatically. 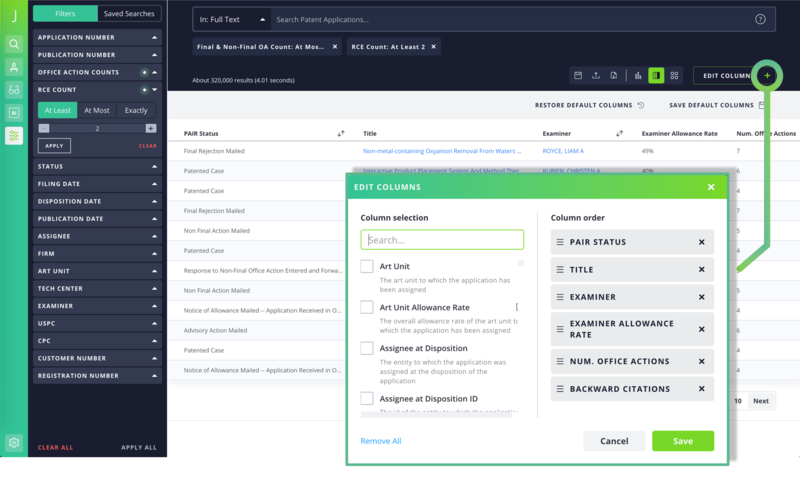 You can easily discover, for example, how many applications your organization has filed in the past five years that have had at least 4 office actions and 2 RCEs before a specific examiner, tech center, art unit, CPC or USPC class. Or narrow further by attorney registration number, number of backward citations, references to Alice Corp. v. CLS Bank... you name it. The possibilities are endless. Platform users also have access to Private PAIR integration, so your data is always up to date within 24 hours. Juristat stores your PAIR data on your own Virtual Private Cloud to ensure maximum data security and accessibility. Are you ready to try Platform? Contact our Sales team for a demo.